I mentioned before about getting used to ingredients here in England. 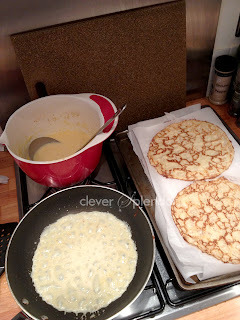 One is butter, it's yellower (not ideal for vanilla frostings), and has a higher fat content. I also just found out egg sizes here are bigger than America. I feel like I had an epiphany when I read this post on Nigella's site. Makes sense, the large eggs here are equal to US extra large - all my recipes seem to respond differently here. At least I can make sure my eggs are medium from now on, we'll see how far that gets me. I'm still working on getting an adapter for my KitchenAid. I've broken 2 hand mixers in 2 months. And I wasn't even mixing that much. But hand mixers don't have a low and my kitchen gets covered in either confectioners sugar or flour every time I bake. 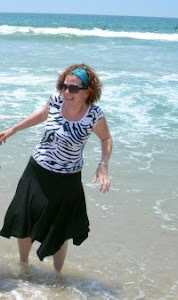 I really miss my precious mixer. I didn't want to spend the money on the converter, but after breaking 2 mixers, it's time to spend the £70 and get it. I've done a lot of baking, even without my big mixer. 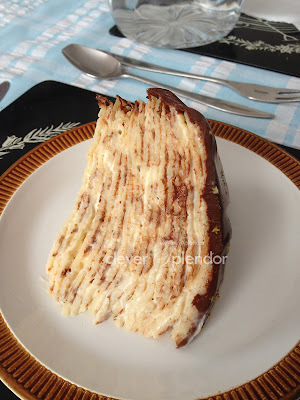 Much to my father-in-law's delight, I make something new every time we go for Sunday lunch. Blackberry pie using local berries we picked. For the crust I used half butter, half Trex (UK equivalent of Crisco, but all natural). It's very flaky. Almost too flaky, if that's possible? 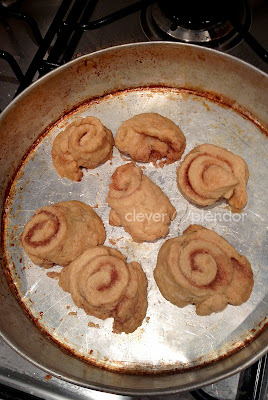 Cinnamon sugar pinwheels using leftover crust. I swear I preferred these to the pie, mostly because they remind me of my childhood, my mom used to use these same pans to make hers. 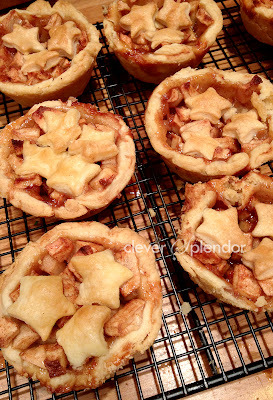 Mini apple pies using my father-in-law's neighbor(u)r's 'fallers' from her apple tree. I saw these on pinterest and wanted to try it. Very fussy for apple pie but appealing to people I suppose. 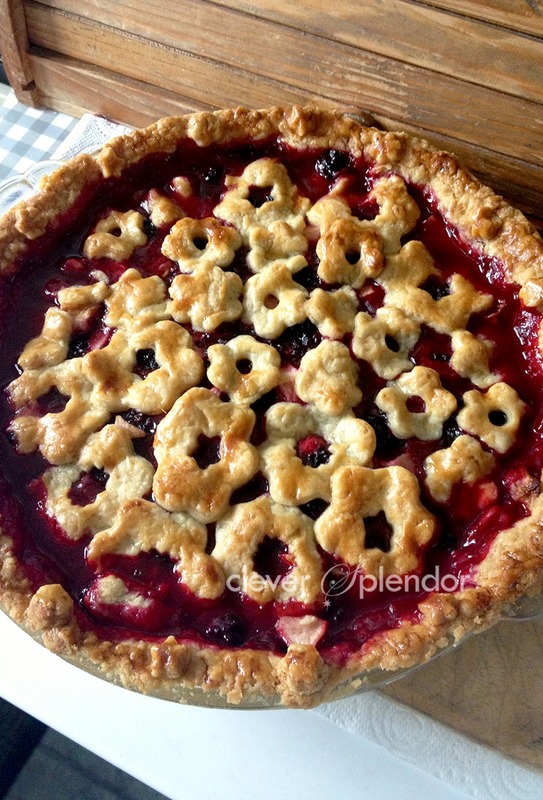 I prefer a normal pie. 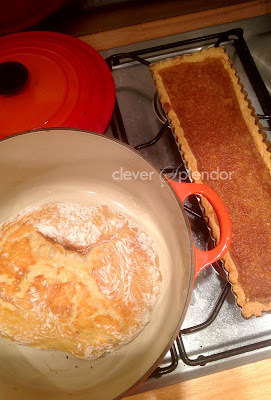 Le Creuset bread (tasty!) and a treacle tart. Also a request from father-in-law. 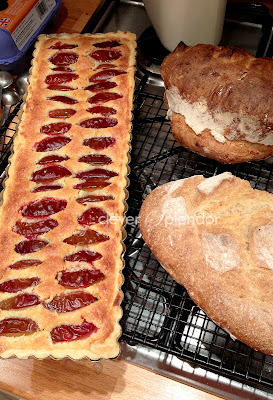 Plum frangipane tart using my father-in-law's neighbor(u)r's plums. Delicious. Also, another bread test, not as good as the above bread though. I used 1/3 whole wheat flour, not sure if that made a difference. 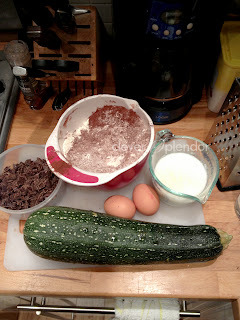 My neighbo(u)r gifted me a (marrow/zucchini/courgette), so I made my recipe for double chocolate zucchini bread. This recipe makes 2 loaves and uses 4 cups of zucchini. 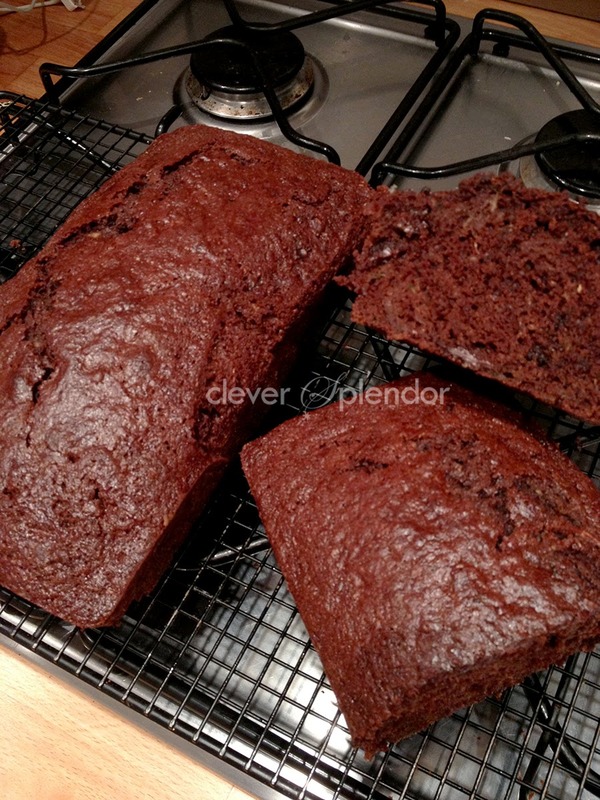 Very rich & delicious - gave some to 2 neighbors plus my father in law and saved some for us. 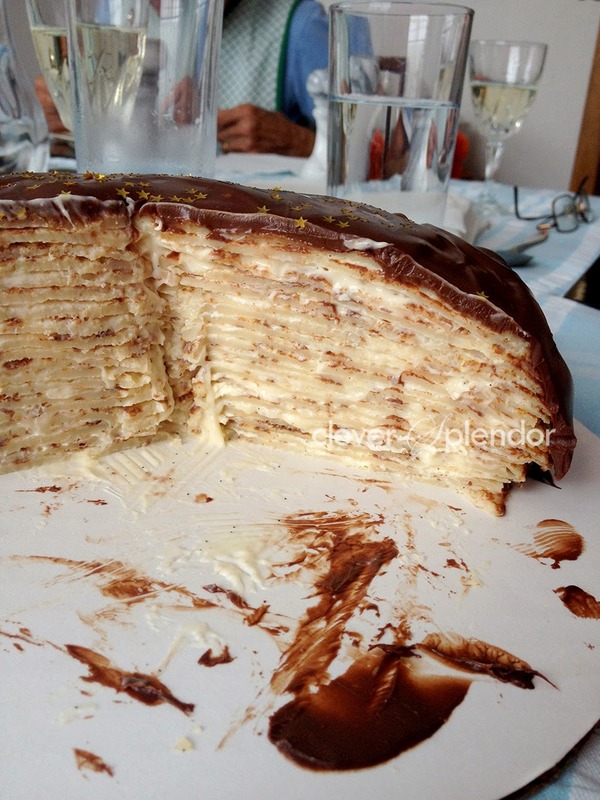 Mille Crepe cake. I've always wanted to do one, they look so pretty, but man what a chore. As you can see, the final product is gorgeous. 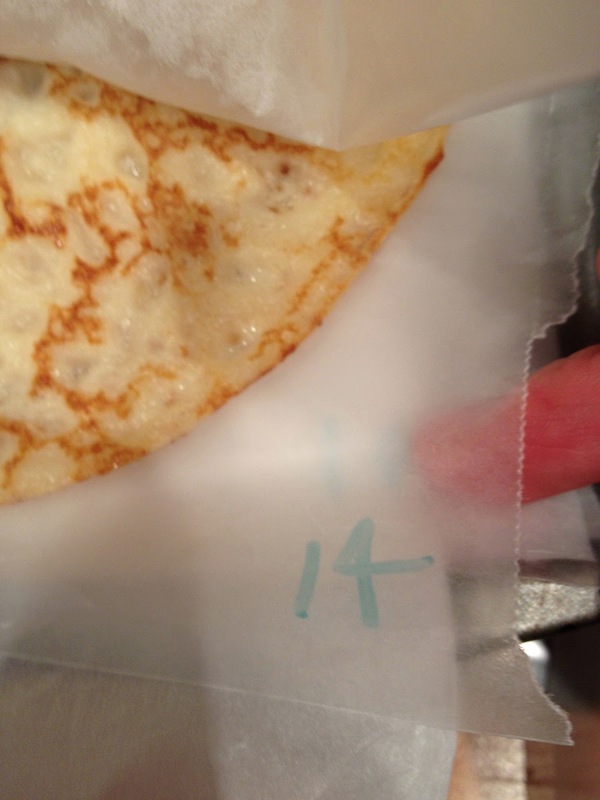 In process, I screwed up the first crepe, so I only had 19 to layer. That annoyed me, only because 20 crepes sounds more impressive. I started writing on my wax paper so I could see progress. See how tiny my kitchen is? 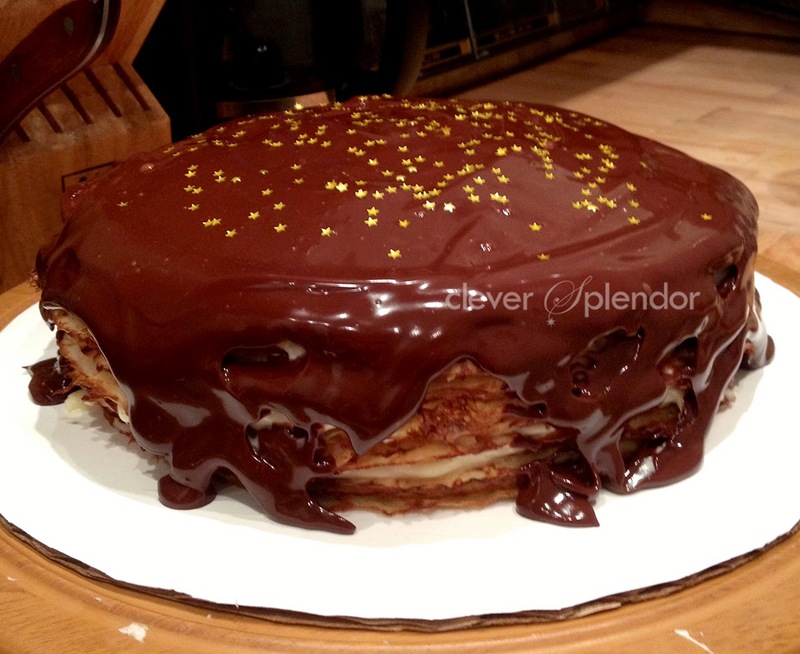 I made a vanilla pastry cream and topped with chocolate ganache. If I were to ever repeat this tedious dessert, I'd use chocolate ganache inside because it would be richer I think. It kinda tasted like a soggy eggy thing. I suppose that's how it's supposed too, but for all that effort I'd rather make a real cake. 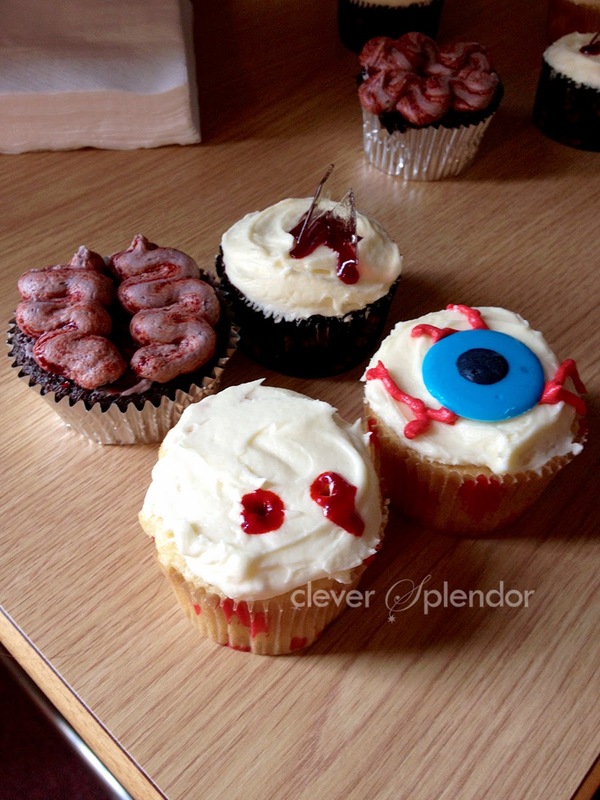 Zombie themed cupcakes for my first real Bristol commission (a city council leaving do). They were a hit I hear. Hoping I can get more work out of it. Red velvet, chocolate and vanilla cakes. The vampire one has sour cherry jam inside too, wish I could've seen people's faces when they bit into it.